There are very few things in life – if any – that offers the mix of emotions when having your first child: it’s exciting, thrilling, and scary all at the same time. 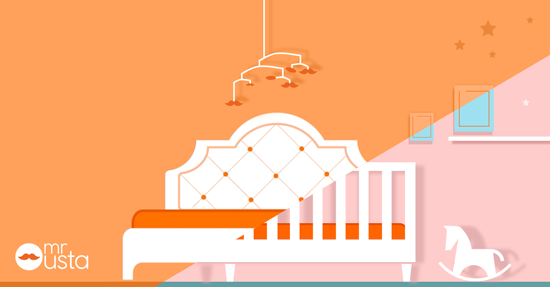 But when you’re expecting, it’s best to plan way ahead of time and get that spare room (if you have one) turned into a nursery that’s suitable, safe, and comfortable for your child and you. So where to start with turning that room into a nursery? First and foremost, clean that room out. Whatever you were previously using that room for, you need to empty out. Avoid the clutter by deciding what you want to keep, what you want to toss away, what can be used in the nursery, and what you want to donate to any number of charities here in the UAE. When that room is empty, give it a good scrub (or hire someone to do it) before you start transforming it into a nursery. Cleanliness is key throughout the entire process as you need that room sanitized to ensure a clean and healthy space for your newborn. Meaning – start first with the floor before you work up to the walls and the furniture. Flooring is important here and it has an important impact on your child’s health and safety, especially when they get old enough to start crawling. You can opt for carpeting as carpets help cushion falls and are soft, but they stain easily and need to be cleaned repeatedly (as they make a comfortable home for germs and no-good-ums). Tiles and parquet are built to last, but may be uncomfortable for the baby; however, in terms of planning for when you no longer need the nursery, tiles, marble, ceramic flooring, and parquet may be the way to go for their durability and, of course, will save you money in the long run. Add some color to the walls. When choosing the paint, the TYPE of paint you choose is just as important as the color. Go with paints (such as latex paints) that are easily to clean, but to make sure they are lead-free and with little and no volatiles (the nasty chemicals in the fumes). There are plenty of options out there – talk to a professional to learn more. So you also need to decide on the colors. Naturally, you’ll probably go with brighter colors and those that are more specific to gender – typically, baby blue for boys and pinks and purples for girls. But in this day and age, you can opt for gender-neutral colors that have become the trend like yellows and greys. Even better, you can go for themes (that are also gender blind); for example, you can go for a forest-based theme (darker greens and yellows), outdoors theme, or an ocean theme, or simply for a pattern-based, modernist/simplistic take. You’ll be spending a lot time in that room, so make sure that the lighting is adequate for both you and the baby. A table lamp and a nightlight is a must; we highly recommend installing a ceiling fan/lamp combination too as it keeps the air circulating and, trust us when we say this, your baby will be INFATUATED with it. Invest in the right furniture. For your nursery, furniture must be first and foremost practical, and secondly, aesthetic. Furniture is not cheap, especially nursery furniture, so keep that in mind. The most important piece of furniture is obviously the bed/cot. You can buy it from the multitude of furniture galleries in the UAE, but we recommend going for the personal touch and getting it custom-made. Not only do you have control on the quality and material, but you can get creative and get the furniture made so it has future uses too after your child is all grown up (future-proofing is key here). Bear in mind, this is a relatively expensive option and does require a sizeable investment, but getting the furniture custom-made is well worth it if you can afford it. The second most important piece of furniture is a comfortable chair. Especially for the mothers out there, you’ll be spending a great time there breastfeeding your baby, so comfort is a must. In addition, a wardrobe and a chest of drawers will add that much-needed storage to the room and a changing table is an optional extra; again, you can opt to buy them ready-made or get them made. Finally, keep that room clean! After getting the nursery done, and purchasing all the baby requirements (toys, clothes, diapers, and so forth), keep in mind that for the health of your baby and you, you need to keep that room clean. Juggling between a newborn and your day-to-day responsibilities can a hassle and chaotic; get some external aid to help clean the room (and the rest of the home) and perhaps, even when your child gets older, it may worth looking into a full-time maid with nanny qualifications. Having a baby is exciting; it’s the first day of the rest of your life (or the last day of your previous life – depending on how you look at it). Getting the home ready for your new family member is not easy work but it’s something that has to be done. If you don’t have the time, experience, or confidence to design and convert that spare room into a nursery, then turn to an interior designer for that extra support. They will handle everything from A – Z based on your vision. Again, it’s an investment, but an investment that’s worth every dirham.